Rory O'Malley is a performer on the rise...He is best known for playing "Dave" in the motion picture "Dreamgirls," stealing the song "Cadillac Car" from Eddie Murphy. 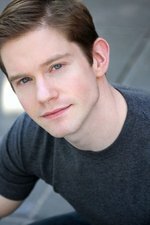 Rory made his Broadway debut in "The 25th Annual Putnam County Spelling Bee" and just made his Off-Broadway debut in "NEWSical the Musical." (which was produced by fellow "Adaumbelle's Quest" participant Tom D'Angora and starred fellow participant Christine Pedi as well as upcoming participants Christine Bianco & Michael West). Regionally, he created the role of "Richie Cunningham" in Garry Marshall's "Happy Days: The Musical" at the Goodspeed Opera House, Paper Mill Playhouse and recorded the original cast album. Rory is also the co-founder of "Broadway Impact" (along with two-time Tony Award Nominee and fellow "Adaumbelle's Quest" participant Gavin Creel), a coalition of the theatre community fighting for marriage equality. To keep up with Rory and all he has going on, be sure to follow him on Twitter! 2. Who is the one person you haven't worked with that you would like to? Audra McDonald. 3. Do you have any strange or unusual talent that no one knows about? I can make my hands look like they are made of rubber by shaking them fast. It's on my resume. RUBBER HANDS! 4. Favorite way to stay in shape? Love to run, but fellow "NEWSical" cast member Michael West has gotten me into P90X. So hard! 6. Favorite TV Show? "MAD MEN" on AMC and "THE UNIVERSE" on The History Channel. 10. "Family Ties" or "Growing Pains"? "Growing Pains." Apr 21 J.B. Ghuman Jr.